Get your chores done! Haven’t you finished that job yet? I thought I told you to clean your room! If I have to tell you one more time . . . ! Our nagging words don’t work, do they? They return void, unlike God’s words that accomplish His intended purpose every time. We desire to manage our households, teach our children, and provide a reasonably clean and orderly home. Life is much less complicated if our children cooperate and do what we ask the first time! Nagging doesn’t accomplish our ultimate desire for our children and families. However, while moving at the speed of life, we operate under the false assumption that nagging works, at least temporarily. So . . . we resort to nagging, which is unhealthy for parent/child relationships and attitudes. Many of us are not “naturally” organized. Even if we are prepared, we still juggle many balls, while we add the curve balls God throws on occasion. We desire a God-honoring home where we cheerfully work together, but we sometimes believe we can merely issue orders hoping our children fall in line. Worse, we do not train our children because it is too much hassle. We divide learning and life when, in reality, they are components of a whole; children learn academically and from working. Possibly, we dislike home chores, and our attitudes influence our children. Our problems grow if we move through each day without a specific plan to teach good work habits. If nagging words aren’t effective, what is? In my fantasies, I picture a magic formula that produces cooperative children, makes chores run smoothly, and lightens the workload. Alas, no magic formula exists, but available tools and a few guidelines help us train our children. The specific tools aren’t as important as accountability. In my experience, it is the hardest part of parenting. Follow-up takes effort, but perseverance plus time pays off. Begin early. Even toddlers can do some chores. If working together is what the family always does, children will learn cooperation. Attitude counts—theirs and ours. 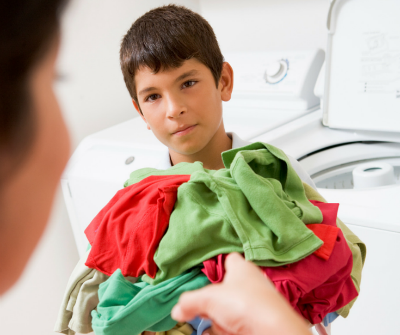 Assign age-appropriate chores to each child. Show him how to do the chore and hold him accountable to do a good job. No tool is perfect, so experiment to find what works for you. Helpful tools alone do not do the job; your interaction trains your children. Chore charts are effective tools to solve many training problems. 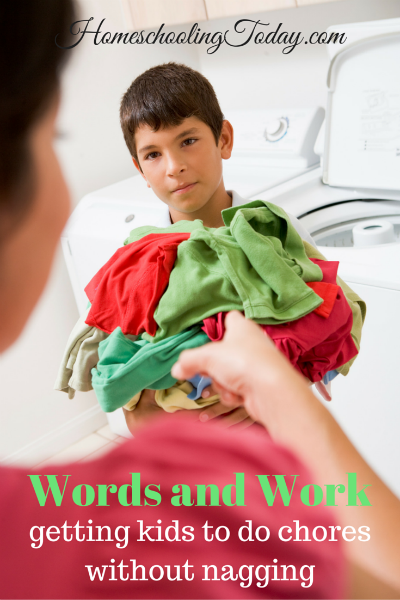 Keeping track of children’s chores produces numerous advantages.. If you are unorganized, chore charts provide a path to follow. They help you and your children stick to a simple, workable structure to accomplish the necessities. If you generally are organized, chore charts helps in hectic times by keeping the family on track. If you are unavailable due to illness or absence, children have a reference guide and Dad has extra help to keep everyone moving in the right direction. Chore charts set the expectations for work and make nagging unnecessary. With charts, children can’t say they don’t know what to do. Chore charts give you feedback and give children visual confirmation of progress. You have opportunity to praise and to mentor as needed. Chore charts provide a “list” to follow as you come alongside your children, teaching them how to do various chores. Chore charts are peacemakers, indicating who is responsible for which chore, avoiding arguments. Many colorful and useful chore charts are for sale or free on the Internet, or you can make your own. Don’t use someone else’s system if it doesn’t work for you. Keep it simple. You are more likely to abandon a complicated system than a simple chart that works. If necessary, use different charts for younger and older children and rotate chores. Use pictures for younger children, drawn or cut from magazines and added to a chart, i.e., a set dining table if they set the table, dishes if they help with dishes, a neatly made bed, and so forth. Slide an 8.5”x11” chart into a protective, plastic sleeve, allowing children to mark their chores with an erasable marker without marking on the original. If one large chart in the kitchen doesn’t work, try individual room charts in each room. Plan a regular—well, reasonably regular—family work time and work with your children, supervising chores and teaching them to record completed jobs. Make needed supplies easily available; possibly duplicate supplies in each room or area. Follow-up and accountability are important. No mom will achieve this perfectly, but the more you purposely train your children the more freedom and joy you and your family will experience. After all, a clean house is not the only thing we seek. We desire good work habits for our children and working knowledge about caring for their future households. Soon your words will return to you having accomplished their intended purpose—maybe even the first time! Marilyn Rockett is a veteran homeschool mom of four grown sons who has mentored moms for more than twenty-five years. Her latest book, Homeschooling at the Speed of Life, provides organizational helps and encouragement. Visit her website at www.MarilynRockett.com. —Originally published in the “God’s Word Does Not Return Void” issue (May/June 2009) of Homeschooling Today magazine. Subscribe today! I loves these ideas! Thanks for sharing!